Primavera P6 is the standard project management software tool used worldwide in industries such as Construction, Oil & Gas, Manufacturing, Energy and even IT. While there are lots of project management tools on the market, Primavera P6 shines in being able to manage large and complex projects and to do it well. Learning Primavera P6 can have its advantages and even lead to a great career in project planning & scheduling. Read-on and learn about about how you can succeed with Primavera P6. Maybe we think we aught to be great from the start. But reality is, we just aren’t. But we get better and better every learning step we take. And once we break through our doubts, our progress is quickens. At Plan Academy, our training is built around a straightforward learning model that is captured by the words: Watch, Try, Practice, Succeed. Watch our videos to learn a scheduling concept or procedure in Primavera P6. Try it on your own copy of Primavera P6 as you follow along with the video. Many of our videos include P6 project files & layouts you can download and follow along with. Practice your skills with our course workshops; workshops offer you the chance to work out a problem on your own copy of Primavera P6. Succeed and earn your Primavera P6 training certificate. Whether you are completely new to Primavera P6 Professional, or just need a refresher, we’ve designed our Primavera P6 training so you can feel confident in your learning progress at every step. Are you ready to learn Primavera P6? Plan Academy has built a Core Curriculum as a series of video Courses. These are Courses are essential for any Primavera P6 user to learn the skills needed to succeed with the tool. Each Course builds on the previous Course. The entirety of the Core Curriculum videos will take you through building a realistic schedule or project in Primavera P6 Professional, from a blank slate to progress updating. Let’s take you through the Core Curriculum in detail. Here’s where your education begins. Our Introduction course sets the stage for your work in Primavera P6. You’ll learn about P6’s database, a bit about screens, then you’ll start with your building a real project schedule, including WBS, Activities and logic. Watch a Sample Video from the Introduction Course. No good Primavera P6 education is complete without key Project Controls principles included. In our in-depth Scheduling course, you will get a refresher on Critical Path Method Scheduling and then learn all about how P6 schedules activities. Watch a Sample Video from the Scheduling Course. Get deeply acquainted with Primavera P6’s resource capabilities in this course. You’ll start by creating Resources for your project and then you will practice resource-loading your schedule while exploring P6’s many options. Watch a Sample Video from the Resourcing Course. So you might finish on-time, but what about on-budget? Learn how to manage costs in Primavera P6. This course will teach you how to cost-load a schedule by working with resource costs and expenses. Watch a Sample Video from the Cost Management Course. What is the purpose of using Activity Codes in P6? What are Activity Codes and how do they work? You’ll find out how Activity Codes can be an invaluable tool for performing analysis and reporting in this course. Watch a Sample Video from the Activity Codes Course. Tracking your project to a Baseline? You should be. Learn the concepts behind how Project Baselines work in Primavera P6. You’ll learn how to create Baselines, recommendation on when to Baseline and how to track progress to a Baseline. Watch a Sample Video from the Baselines Course. One of the most important topics in project management is Progress Updating. You’ll go deep on all of Primavera P6’s set up options and learn to progress & update your schedule. You’ll learn about P6’s Data Date and explore percent complete options. This is essential knowledge for your success. Watch a Sample Video from the Progress Updating Course. Our Bonus Courses are not part of the Core Curriculum and they are not required to earn your Primavera P6 certificate. They are included in ALL memberships – you get FULL ACCESS to both of these courses. 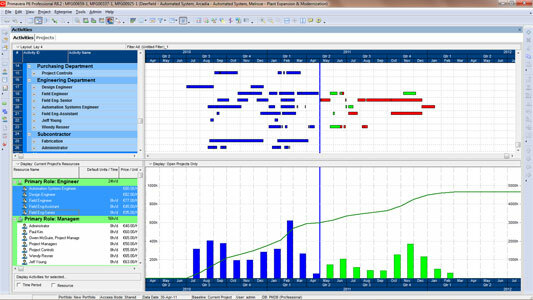 Using Excel alongside Primavera P6 has become a MUST for many planners. In this course, you’ll learn some innovative ways to quickly and easily generate compelling graphs and charts in Excel from P6 data. Watch a Sample Video from the Advanced Reporting Course. Primavera P6 Professional’s big brother is called Primavera P6 EPPM and he is completely web-based. Start learning Primavera P6 EPPM and see how you can plan in the web. More courses on EPPM to come. Watch a Sample Video from the Primavera P6 EPPM Course. In order to learn Primavera P6, you’ll want to use the software. If you don’t already have a copy, a trial copy Primavera P6 Professional is available and we’ll point you to it. In fact, we’ve put together a detailed Guide to show you step-by-step exactly how to download and install the latest version of Primavera P6 Professional. The Guide is always available to members in our Resource Library. We stand by our training. That’s why we offer a 30-Day Money Back Guarantee on all of our memberships. Start your Primavera P6 Training with Plan Academy today. If you are not 100% satisfied with your membership, we will refund 100% of your tuition at any point in the first 30 days from your registration date. Combined with our flexible payment plans, there’s no reason not to get started right away. I’M READY TO LEARN PRIMAVERA P6 TODAY. LET’S START.